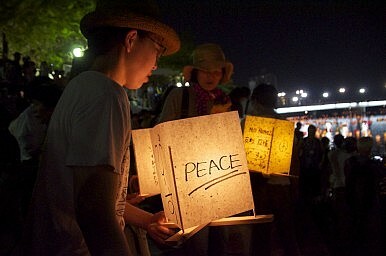 A lantern floating ceremony on the anniversary of the Hiroshima bombing. At the NPT review conference, Japanese politicians and citizens push for a nuclear-weapons-free world. Japanese actors, including diplomats, mayors, and hibakusha (victims of the atomic bombing), are again playing a prominent role at the ninth review conference of the 1970 nuclear Non-Proliferation Treaty (NPT) to press for the elimination of the estimated 16,000 nuclear weapons in the world today. The NPT is intended to promote the development of nuclear energy for peaceful purposes, stop the proliferation of nuclear weapons, and eventually eliminate nuclear weapons. Five states have signed on recognized as nuclear states, including the United States, Russia, the United Kingdom, France, and China. These states have the burden of “negotiating in good faith” to reduce and ultimately destroy their nuclear arsenals. The remaining 186 signatories — particularly Japan — are getting frustrated at the slow pace of progress toward nuclear disarmament. But this has not stopped Japanese Foreign Minister Fumio Kishida from renewing calls to “accelerate nuclear disarmament.” Kishida urged the world’s leaders and youths to visit Hiroshima and Nagasaki, where the United States dropped atomic bombs 70 years ago, to “witness with their own eyes the reality of atomic bombings” that left over 200,000 people dead. He pointed out in his speech at the NPT review conference, “to date, reductions have been limited to strategic nuclear weapons possessed by the United States and Russia, but all nuclear weapons of all states possessing nuclear weapons will need to be reduced. Kishida asked for “common recognition of [the] humanitarian consequences of nuclear weapons” and of “the unity of international community to achieve a world free of nuclear weapons.” Kishida, a House of Representatives member, represents constituents in Hiroshima Prefecture. Sumiteru Taniguchi (86), one of many hibakusha fighting for a nuclear-free world, is on what is likely his last trip to appeal to the United Nations. Taniguchi, who was 16 years old and 1.8 km away from ground zero when the atomic bomb hit Nagasaki, has been championing the cause of “no more hibakusha after me.” Though the average age of hibakusha reached 79.44 at the end of March last year, and they are less able to participate directly in such international activities, their children are taking up the cause. Kane, the high representative for disarmament affairs, also endorses the role hibakusha play: “It is good that the hibakusha and also Japan are making such strong efforts to bring it back to people’s memories, to remind them of the horrors of the effects of such an explosion. Japan is, of course, not only concerned about the elimination of nuclear weapons as an abstract or purely moral issue, but because of fears that North Korea might develop, or already possess, nuclear bombs. North Korea has declared that it has withdrawn from the NPT. Though Japan often cites the atomic bombings of 1945 for its special role in the international disarmament movement, its “nuclear allergy” rose domestically in response to the 1954 Lucky Dragon Incident, when the crew of a Japanese fishing boat was exposed to nuclear fallout from a U.S. nuclear test on Bikini Atoll. In 1967, anti-nuclear sentiments prompted Sato Eisaku’s three non-nuclear principles. Japanese sensitivity about the world’s callousness with regards to nuclear weapons was recently highlighted by the back-and-forth between Matsui, Taue, and hibakusha on one hand and Russian President Vladimir Putin and his envoys on the other, following Putin’s remarks about possibly having nuclear weapons at the ready. Shinzo Abe insists that the treaty is unrealistic, but civil society is pushing back.